This hardware meter includes USB interfacing and a plug-in for convenient DAW integration. With the industry-wide drift towards loudness normalisation, we must all be acquainted with the appropriate metering tools. While there are countless variations available as third-party plug-ins and, increasingly, as built-in options for many DAWs, sometimes a hardware meter makes more practical sense. This is especially true in live broadcast mixing situations (a core market for TC Electronic), but it’s also useful for DAW-based setups, where it can free up screen real estate, the demands on which are not inconsiderable these days! Not only have TC Electronic built up a great deal of experience in loudness metering, but the company played a leading role in the development of the international loudness normalisation standards. They also invented a bespoke and unique ‘radar’ loudness-history display, which I think is one of the more elegant solutions. TC Electronic’s new Clarity M hardware meter draws all this experience and technology together in a very neat and capable seven-inch desktop meter system, designed specifically for both music production and sound-for-picture applications, and available in both stereo and 5.1 formats. It conforms to the latest loudness normalisation specifications (ITU BS.1770-4) and all related international variations, and its firmware can be updated via a USB connection should the standards continue to evolve. 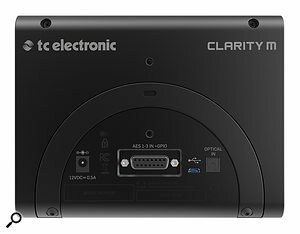 The physical measurements of the Clarity M are 182 x 140 x 25 mm (7.2 x 5.5 x 1 inches), and it weighs 0.85kg (1.9lbs). As shipped, the rear panel incorporates a semi-circular plate, and this can be unscrewed and cleverly repositioned to provide a desk stand, but there are also M5 mounting holes for a RAM-style bracket if preferred, enabling the meter to be attached directly to a wall or shelf. Power is courtesy of a supplied universal ‘wall-wart’ (12V DC at 0.5A) with interchangeable mains connector plates and a coaxial DC output plug. Although the big news is arguably the DAW plug-in, the Clarity M functions as a completely stand-alone digital meter, with AES and optical S/PDIF connectivity.Also on the rear panel are a 15-way D-sub connector, an F05 Toslink socket (optical S/PDIF only, not ADAT), and a micro type-B USB 2 port. The unit cannot be powered over this USB connection, which is used instead for firmware updates, preset modes file management, and for receiving audio via a dedicated DAW plug-in (see below). A suitable 1m USB type-A to micro type-B cable is included, along with a breakout cable for the D-sub socket which terminates in three BNC plugs, a quarter-inch TRS socket and a 3.5mm TS socket. The three BNCs accept up to six (5.1) channels of unbalanced AES3id or S/PDIF inputs (impedance adapters are required for standard balanced AES3 sources, and BNC-phono adapters for S/PDIF sources). The larger of the two jack sockets accepts two GPI inputs, while the smaller one provides a single opto-isolated GPO output, and these are intended for connection with two switches (eg. a dual footswitch) to operate the start/pause and reset functions of the loudness meter, and to provide a control signal for an external peak/overload warning light. The high-resolution (800 x 480 pixel) colour TFT widescreen display measures roughly 155 x 90 mm. 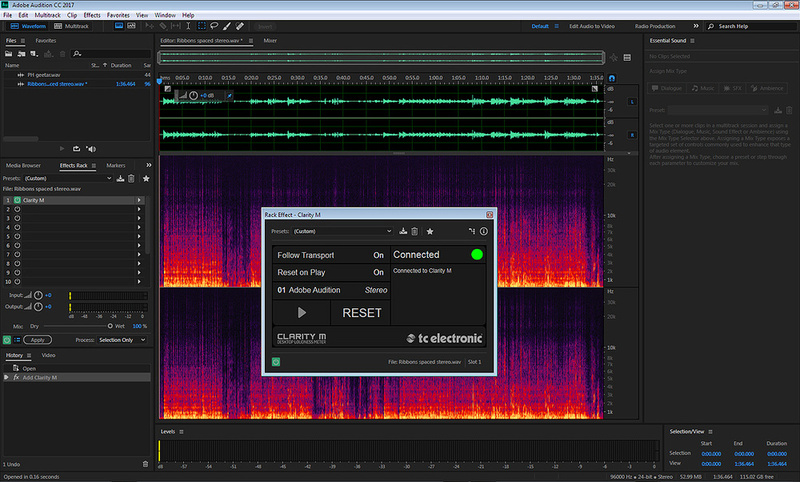 The graphics are arranged in two halves, with the left-hand side featuring either TC’s aforementioned radar loudness history meter or a real-time 1/3-octave analyser, while the right-hand side carries the numerical loudness readouts, true-peak bar-graph meters (stereo or 5.1, depending on the audio source), down-mix correlation and loudness deviation meters, and peak indicators. This part of the display also shows the various system and preset library menu pages and related parameters when required. Six soft buttons and a central encoder knob arrayed under the screen provide a very straightforward user interface accessing all the relevant operational functions, mode preset library, parameter editing and system configuration. The only aspect of the controls that caught me out occasionally was that I kept trying to press the encoder knob to confirm a selection, when it is actually necessary to press one of the soft keys — something that has more to do with the operating paradigms of many other devices rather than any actual issue with TC Electronic’s user-interface. For anyone not already familiar with TC’s radar display, the circumferential bar-graph shows the momentary loudness (scaled in LUFS, LKFS or LU) and behaves much like a VU meter, with the 12-o’clock position corresponding to the (adjustable) loudness target value. The inner radar sweep shows the current and historical Sliding (or short-term) loudness value, with the outer-most yellow ring revealing signals above the target value, and the adjacent light-green ring inside being levels below the target value. The level steps between each of these concentric rings are adjustable, as is the rotation time, but the defaults are 6dB and four minutes. Users can choose to display either TC’s classic radar loudness meter, visible on the main photo, or a 1/3 octave frequency analyser. Red lights in the top two corners illuminate if either the true-peak level or maximum loudness exceed their (adjustable) thresholds, while flags at the bottom of the radar display confirm the meter scale, the rotation period, the current preset selection, and whether any of its parameters have been edited. The preset library currently comprises seven directories, each with five options — but more can be added if international standards evolve or local requirements or preferences differ from the set standards. The default directories contain presets for the ATSC/A85 (USA), OP59 (Australia), CCTV (China), EBU R128 (Europe), and TR-B32 (Japan) international variants on the loudness standards, as well as modes for film, and the music/podcast markets. For each of the broadcast modes, the options within their directories cover applications like continuity, TX codec margin (typically working with an increased safety margin for the true-peak limit), ingest, live production, and short-form content (ie. adverts and trailers, which are restricted by the maximum sliding loudness level in addition to the integrated loudness). Helpfully, the music and podcast directory presets include options for both music and podcast production, as well as general music and iTunes mastering — with loudness targets of -12 and -16 LUFS, respectively. On the metering side, the true-peak bar-graph meters have excellent resolution with a range spanning -60 to +3 dBTP, and when working with 5.1 source material the meter sequence can be configured either in L, R, C, LFE, Ls, Rs (EBU) or L, C, R, Ls, Rs, LFE (film) formats. 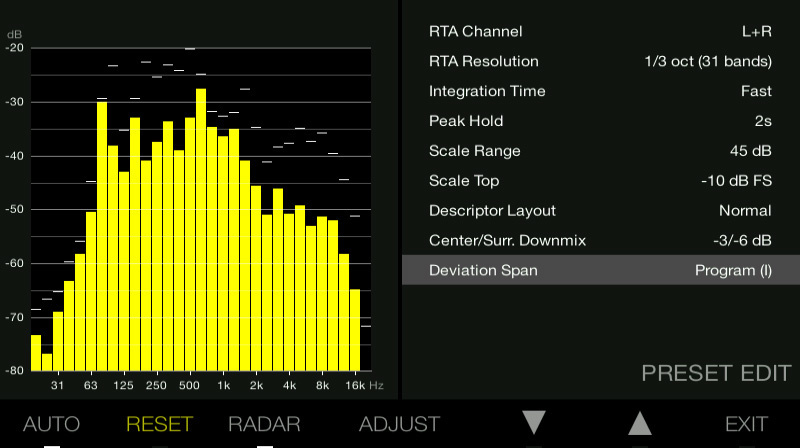 Just below the true-peak meters are horizontal deviation and correlation meters. The aim of the deviation metering is to give an idea of the loudness of a downmix relative to the source — a stereo downmix derived from a 5.1 source, for example, or a mono downmix from a stereo source. This is important information to guide the contribution of signals routed to the centre and surround channels in a 5.1 mix (the meter’s internal downmix matrix can be configured for different centre and surround contribution levels), especially for live broadcasting applications, or in choosing the optimum pan law for stereo work. Below the deviation bar-graph is a phase-correlation meter. In stereo mode a single meter reveals the correlation between the left and right channels, while for a 5.1 source two meters appear, one showing correlation between the front L/R channels, and the other between the rear Ls/Rs channels. Up to six configurable numerical readouts are located in the centre of the display, the specific parameters being selectable from defined display formats named Normal, Full List, Basic, Live Production, Single Sliding, or Single Program. Full List provides the integrated loudness value, the maximum true-peak level, maximum loudness, the loudness range (LRA), the peak-to-loudness ratio (in dB) and the sliding loudness value. The alternative numerical layouts omit various combinations of these values to simplify the display and make it easier to focus parameters that are critical in different applications. The current input source and clock-lock status is also displayed at the very bottom of this section of the display screen. If the Clarity M is to be used with a computer, a dedicated plug-in must be downloaded and installed, with separate files for Mac (OS X 10.9 and above) or Windows (7 and above) on the TC Electronic web site. The latest firmware (currently v1.0.5) and factory loudness standard presets (v1.3) are also available. I downloaded the Windows version, which incorporates a USB driver, and was offered 32- and 64- bit versions of VST 2.4, VST 3, and AAX formats (for Pro Tools 10 and above). The Mac version supplements those three with an Audio Units option. 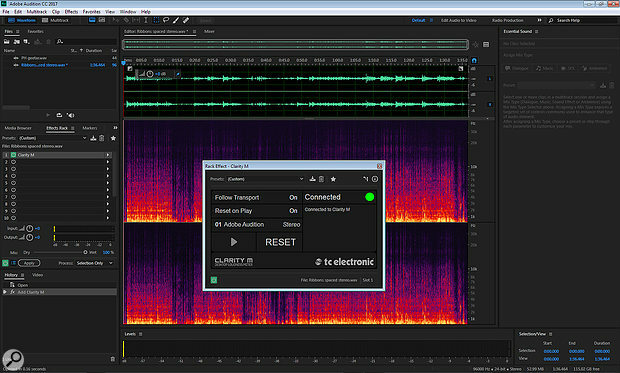 Seen here used in Adobe Audition, the plug-in allows a signal for the hardware meter to be tapped at any point in the DAW signal chain. By default, the USB connection from the meter hardware appears as a remote disk drive on the computer, making it very easy to transfer firmware or preset data files. To meter audio directly from the DAW via USB it’s first necessary to enter the System menu and set the USB mode to ‘Plug-in’ mode. Selecting the appropriate audio for the meter is as simple as dropping the plug-in into the appropriate part of the DAW’s signal chain. The plug-in finds a connected Clarity M automatically (only one Clarity M plug-in can be used at a time), and sends the audio in stereo or 5.1 depending on the format of the host DAW channel. The plug-in GUI couldn’t be simpler: the connection status is displayed on the right-hand side, while the left panel presents options for making the meter’s integration timer follow the DAW transport, reset on each new play command, and to allow the plug-in location to be named — which comes up as the input source on the meter itself. The integration timer can also be controlled manually using play/pause and reset timer buttons at the bottom of the plug-in window. Perhaps it’s my broadcast training, but I personally prefer hardware meters over software ones — I like the reassurance that the meter is always visible and always in the same physical place where I can take in the display at a glance. The Clarity M fits the bill perfectly, with a limited but very practical set of metering tools perfectly focused on the task in hand. The display is very clear and easy to read, as well as being simple but versatile in its configuration. At the asking price, this is certainly not an impulse buy for the project-studio owner, but I consider it to offer good value for money nonetheless, and it’s a positive steal compared to the typical costs of most broadcast-standard metering solutions. If you’re in the market for a hardware loudness meter the Clarity M has to be very high on the shortlist of contenders; I enjoyed working with it a great deal. RTW and DK Technologies both offer various hardware metering systems that present the most obvious competition for this TC Electronics device. Very clear and readable meters and numerical displays. 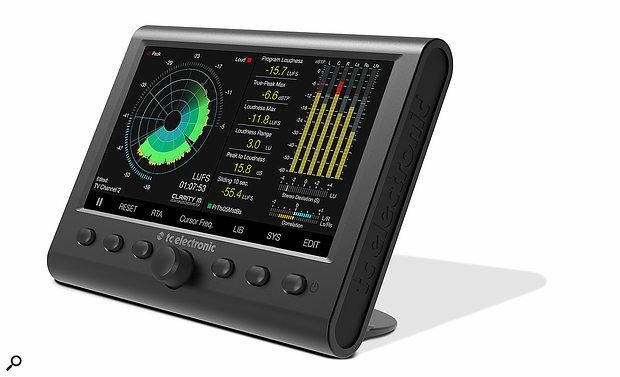 Features TC Electronic’s loudness history radar display. Removes the need to allocate computer screen space for audio metering. A hardware meter will always appear expensive when compared with a plug-in! 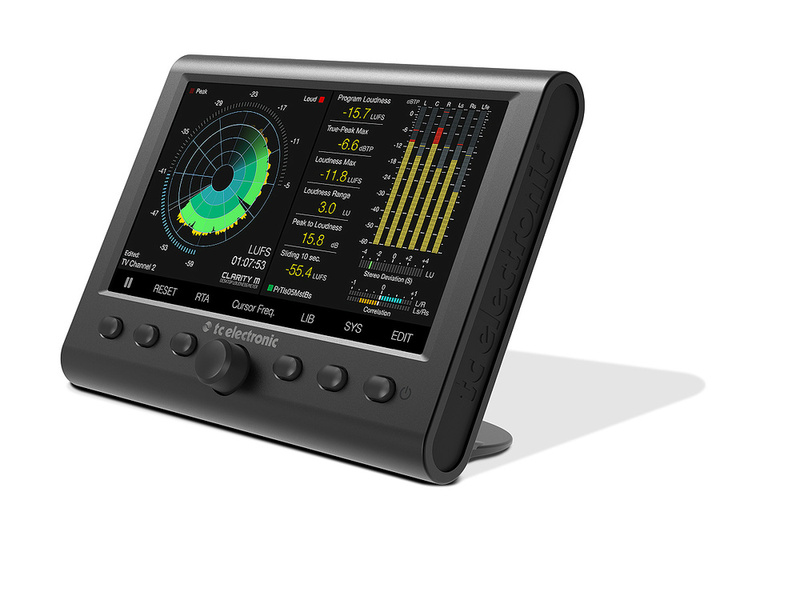 A very elegant, attractive and effective loudness-metering system with TC Electronic’s radar loudness history display, an RTA, true-peak metering, numerical readouts of all relevant programme loudness parameters, and useful downmix loudness deviation and correlation meters.